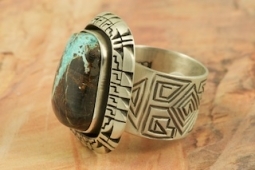 Stunning Ring featuring Genuine Indian Mountain Turquoise set in Sterling Silver. Beautiful Sterling Silver Lightening Design surrounds the Turquoise Stone. The split shank design allows the ring to be slightly adjusted for size. The Indian Mountain Mine is located in Lander County, Nevada. 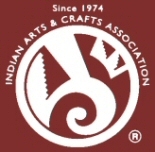 Created by Acoma Artist Tony Chino. Signed by the artist. Size 12. The split shank design allows the ring to be slightly adjusted for size.